Cadent has published a new report on its plans to create the UK’s first large-scale hydrogen network in the North West of England at a cost of around £900 million. A new pipeline will deliver low-carbon hydrogen to 10 industrial sites, including oil refineries and manufacturing plants. 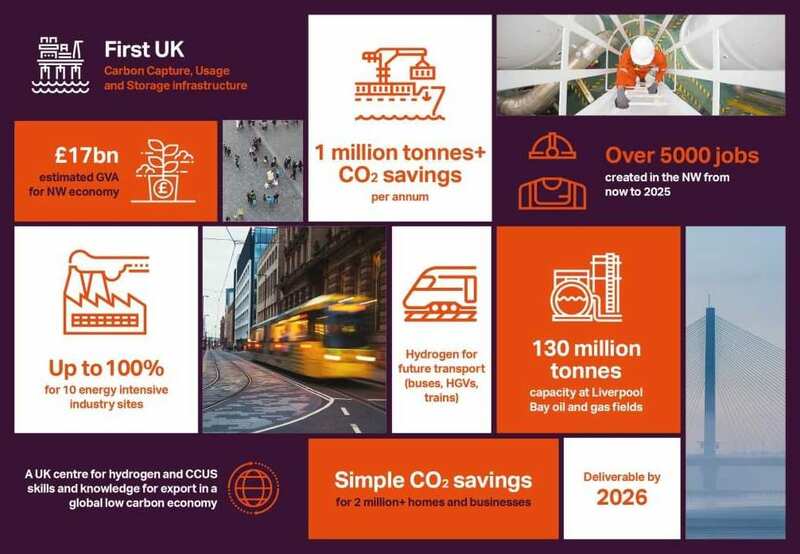 Hydrogen will also be injected into the existing gas network serving Cheshire, Merseyside and Greater Manchester at blends of up to 20 per cent, reducing the carbon footprint of around two million homes. According to the report, the HyNet project will cut carbon emissions by more than a million tonnes annually – the equivalent of taking 600,000 cars off the road. Around 5,000 jobs are expected to be created between now and the completion of the network in the mid-2020s. As well as decarbonising industrial processes and heating, Cadent says the network could also open the door to the use of hydrogen as a “clean” fuel for buses, lorries and trains. The hydrogen will be produced from methane at a new facility in Cheshire – the exact location of which has yet to be decided – using autothermal reforming in combination with carbon capture and storage. Gas fields in Liverpool Bay and elsewhere off the North West coast, which are due to be decommissioned soon, will be repurposed to store the captured carbon dioxide. “This is unquestionably one of the most exciting energy projects for the North West in years,” said Cadent director of safety and strategy Simon Fairman. Cadent is exploring a range of options to fund the project and is “learning lessons” from other large-scale infrastructure projects, such as the Thames Tideway in London. Fairman said discussions will be held with the government and Ofgem to find the most cost-effective funding mechanism. “We also need to prove to the Health and Safety Executive that hydrogen is safe to use at these volumes in homes, which we’re confident of doing through a project that’s already under way at Keele’s university campus,” he added. The project has received the backing of the region’s two metropolitan mayors – Andy Burnham and Steve Rotheram. Rotheram, the metro mayor for the Liverpool City Region, said: “The building blocks are rapidly falling into place to enable the Liverpool City Region and the North West to lead the way in finding cleaner, greener sources of energy. “Using hydrogen to power industry and heat homes in phase one is very exciting, but this HyNet project also sets out a longer-term roadmap towards supplying hydrogen to fuel our trains and buses. Energy and clean growth minister Claire Perry commented: “Clean, green and safe hydrogen has an exciting role to play in powering the UK and Cadent’s investment is a significant step towards this energy source living up to its potential. The initial proposals were unveiled by Cadent in August last year. Fellow gas distribution network, Northern Gas Networks (NGN), also has plans to build a hydrogen network in Leeds. The company’s H21 project secured £8.9 million of funding in Ofgem’s 2017 Network Innovation Competition.